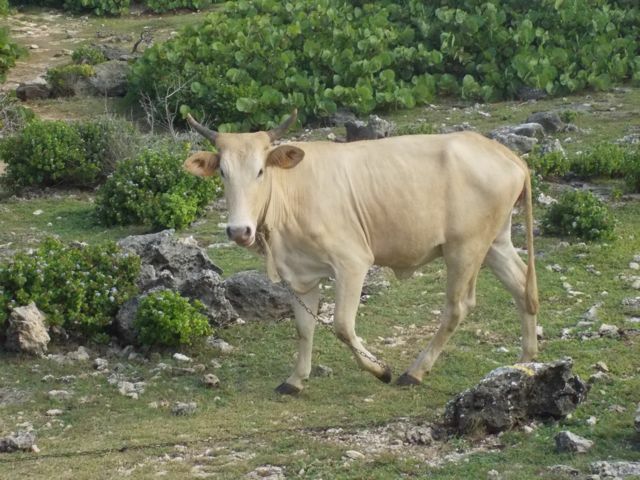 Galley Wench Tales: Bum Steer? opted to give them a wider berth! 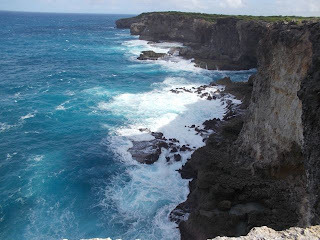 We wandered along a ridge trail overlooking a dramatic view of the Atlantic Ocean in North Guadaloupe. The waves crashed and spewed.... And we saw... steer, sharing the trail, doing what steer do. As we looked over this ridge, the steer was not far behind us. surf. This was well worth a road trip to see. Normally, it's goats we encounter out and about. And chickens. He doesn't understand why I take pictures of them, either. Wayne doesn't understand why I feel compelled to photograph these fellows. To me, it's just to share a slice of life, common here, but very different from what we'd expect in the U.S. Readers, what do you want to see? To my husband's exasperation, I will still likely want and try to capture these; it's just a question of what to post here. Love everything you post and take pictures of so tell Wayne he need worry that the viewer is bored. Keep them coming girl. Thanks, Roxie! Appreciate the encouragement. You know you are welcome to join us anytime. The boat's getting more livable all the time. After our planned US working stint, June - November 2013 it will be even better. From there it's Florida through the Panama Canal to Galapagos then into the South Pacific..... Just in case you need a break from those Pacific NW winters. Spending for Safety: Dinghy Dramas... Done!